The King Cobra, listed as vulnerable on the IUCN Red List of threatened species, is protected under Schedule II of the Indian Wildlife Protection Act. Its numbers are believed to be going down with more and more conflicts with humans. The King Cobra is not an easy snake to manoeuvre. When sighted in agricultural fields or near residential colonies, it’s menacing hood as part of its defence posture and it’s highly toxic venom is enough to give the bravest of people a chill down their backs. Yet, in Kerala’s northern Kannur district, forest officials and the public are collaborating, more often than one can imagine, to assist in the conservation of the feared reptile. 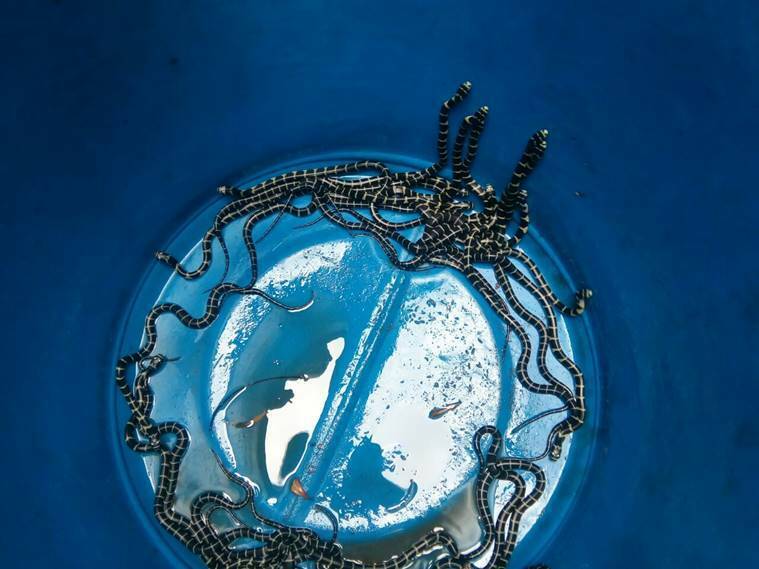 On Sunday, 23 out of 26 King Cobra hatchlings were released into their natural habitat after they hatched at a private rubber plantation in Kottiyoor in the district. The 26 eggs were first spotted by the plantation owner, Chacko, in May this year after which he informed the Rapid Response Team (RRT) of the state forest department. The mother King Cobra, found near the eggs, was first moved to a safer location. A protective net was then thrown around the eggs to prevent it from being eaten by rodents or street dogs. For nearly three months, the carefully-built up nest was closely monitored by the RRT, independent wildlife researchers and locals. As the rains arrived, the eggs were carefully transferred to a plastic basin and covered with dry leaves. Last week, 23 eggs finally spawned, spreading cheer among the local community. The hatchlings have black skin with white bands. “We took the 23 hatchlings and safely released them into their natural habitat where they won’t come in contact with human habitation. People have nothing to fear at all,” said Riyaz Mangad, a member of the RRT. The King Cobra, listed as vulnerable on the IUCN Red List of threatened species, is protected under Schedule II of the Indian Wildlife Protection Act. It used to be found in wide abundance in the Western Ghats, particularly around the Aralam and Wayanad wildlife sanctuaries in Kerala, but numbers are believed to be going down with more and more conflicts with humans. “Unlike the popular perception, King Cobras are shy snakes. They are not interested in mixing with the humans. 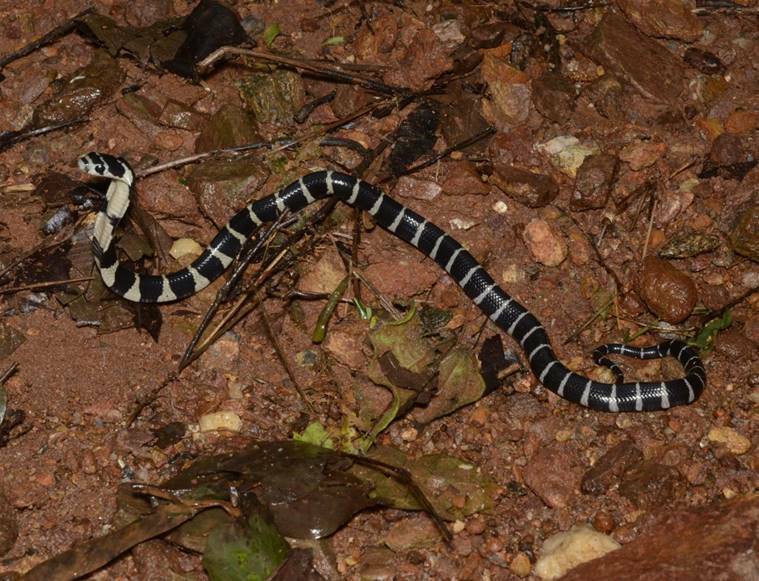 I have been involved in several snake rescue missions, but I have encountered a King Cobra only once in the wild,” said Roshnath R, a wildlife biologist and researcher. “The success rate of conservation of the King Cobra totally depends on public support. We were able to take care of the eggs and release them into the wild once they hatched because of the plantation owner. If he had never informed forest officials, they would have gotten destroyed,” he said, adding that the locals in Kannur were becoming more and more aware of modern snake conservation practices. When snakes are spotted in Kottiyoor or nearby areas, people don’t rush to beat them to death anymore. They have contact numbers of people like Riyaz on their speed dial. The forest officials are promptly called and the snakes safely released into the wild. The hatching of the eggs at Kottiyoor comes just a day after four out of 11 King Cobra eggs spawned at the Parassinikadavu Snake Park in the district. The eggs were bred by one of the mother King Cobras being taken care of at the park. The hatchlings would also be monitored and subsequently released into the wild by park officials. In August last year, a similar hatching effort at a cashew plantation in Kottiyoor was richly applauded by the locals. The same RRT, consisting of Riyaz and others, had helped in hatching nine out of the 20 eggs that were laid by the snake that time. The plantations in Kottiyoor are located close to densely vegetated areas which are seen as ripe for King Cobra nesting. While King Cobras are rarely seen close to human habitation, experts say they come mostly in search of prey. “Our waste management practices are mostly to blame for this. The King Cobras feast mainly on other snakes which in turn look for rodents. Because of our waste practices, there are more rodents near our homes. So when the rat snakes come looking for rats, the King Cobras follow them,” said Roshnath.